The Cavalier King Charles Spaniel is one of the most popular dogs in the UK and its popularity has steadily grown in the US too, so much so that it’s now in the top 20 most popular dog breeds in America. One of the reasons for this popularity is the Cavalier’s friendly and affectionate nature together with the fact that they tend to be good with other dogs and kids. Oh, and they’re an incredibly gorgeous and cute small dog breed too! The Cavalier King Charles Spaniel is an affectionate and gentle little dog that will happily adapt to nearly all living circumstances. They get on very well with kids (and adults too! ), and they also do well with other dogs. This makes them a good choice if you’ve got a young family and/or have got more than one dog in your house. They also don’t have a problem with much larger dogs which is another bonus for those with multiple dogs. As well as being friendly, they’re also very playful and curious little dogs and do demand a lot of attention from their owners. They love a good cuddle and snuggle too though, which also makes them a good choice for the elderly, or as therapy dogs. One drawback of their affectionate nature is that they don’t make very good guard dogs as they tend to greet everyone as friends, even strangers! And the Cavalier King Charles Spaniel can get stressed when alone for long periods, so they aren’t the best choice of pet if you’re not going to be home a lot. And one word of caution is that they tend to chase anything that moves, which is fine when you’re throwing a ball for them but not so good when they are out on a street that’s busy with traffic. Care must be taken when out and about with them as they’re definitely not street-wise dogs. The Cavalier King Charles Spaniel is the smallest breed of spaniel, but quite large for a toy dog. They are usually about 12 or 13 inches tall and the ideal weight is somewhere between 8 and 13 pounds. The head is well-proportioned with respect to the body. Their sweet and gentle facial expression is one of their most endearing characteristics. The coat comes in a variety of colors such as black and tan, the so-called tri-color (black, white and chestnut), ruby, and the so-called Blenheim (chestnut and white). Cavalier King Charles Spaniel puppies typically weigh between 5 to 9 ounces at birth. Normally, a litter consists of about 2 to 6 puppies. You should always purchase Cavalier puppies from a reputable dealer to minimize the risks of inherited diseases (see the section on health problems below for more details). A well-groomed Cavalier is one of the most beautiful dogs you’ll see. And while you might think their coat will need lots of attention and grooming, this isn’t really true. Cavaliers are actually quite easy to look after in terms of grooming. You’ll need to give the coat a good brush several times a week to get rid of tangles and any matting, and to keep the coat nice and shiny. The coat doesn’t really need trimming. Cavalier’s only really need bathing as and when necessary; about every 4 – 6 weeks as a guide. The more they’re outdoors running around, the more they’ll need bathing, obviously. You should check your Cavalier’s ears on a weekly basis. Look for any signs of infection and soreness. If you see any you should consult your vet. Your Cavalier’s nails should be trimmed every few months. If you’re not sure how to clip the nails properly read this guide, or get a professional groomer to do it for you. Cavalier’s teeth should be cleaned at least weekly, if not daily, just like all dogs. The typical Cavalier King Charles Spaniel lifespan is about 10 to 12 years. Some will live much longer than this and others won’t live 10 years. While the lifespan depends on the individual dog’s genes, other factors such as their diet and the amount of exercise they get are also factors. And so too are any illnesses they may pick up or develop. 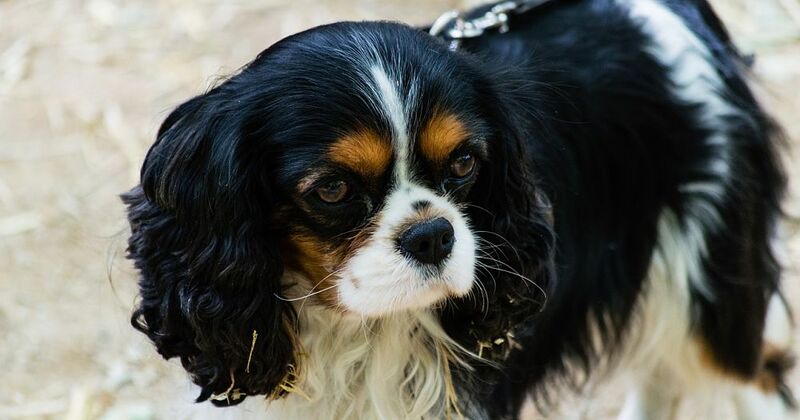 There are a few health issues that can affect Cavalier King Charles Spaniels that you should be aware of so you can make a fully informed choice if you’re considering getting one of these dogs. Heart mitral valve disease (known as MVD) is the leading cause of death for Cavaliers. It’s a degenerative disease that affects the valves of the heart, resulting in heart murmurs and heart failure. It causes the valves to become distorted with the end result that they start to leak. MVD can affect all breeds but it only tends to affect older dogs. But it can affect Cavaliers of any age and may result in the premature death of your dog. Syringomyelia is a common disease in Cavaliers. It affects the spinal cord near to the brain. Cavities filled with fluid develop and these cause pain to your dog. The main symptom you’ll see is your dog scratching their neck because it becomes sensitive. When they scratch, they then feel pain and may yelp. It’s a serious condition that can even result in paralysis. Before it advances, your vet may treat it with non-steroidal anti-inflammatory drugs or cortisteroids. Surgery may be required and although this is usually successful, many Cavaliers may suffer relapses. Hip dysplasia is a hereditary disease that affects up to a quarter of all Cavaliers. It’s basically a malformed hip socket. The end result is often very painful arthritis, so much so that your dog may be completely debilitated. Symptoms include difficulty in climbing stairs, an aversion to exercising, stiffness and soreness, and bunny hopping. There’s no cure for hip dysplasia and so the aim of treatment is simply to increase your dog’s quality of life. Anti-inflammatory drugs and pain killers are often all that’s needed to treat it, but more severe cases will need surgery. Massage may also be used, and if your dog is overweight then reducing their weight can also be an effective treatment. Ester C can also be used to treat hip dysplasia. Brachycephalic airway obstruction syndrome, referred to as BAOS, is another hereditary condition. Because of the shape of the Cavalier’s head, the throat and breathing passages tend to be smaller and flatter which results in a restricted flow of air. Because of the increased effort needed to breathe there is extra strain placed on the heart. Symptoms include noisy breathing and snoring. Affected dogs may get tired sooner during exercise. Obesity makes BAOS worse and so controlling your dog’s weight is an important form of treatment, as is avoiding hot and humid conditions where possible. Anti-inflammatory drugs may be used to treat BAOS. These don’t cure the disease but just manage the condition. In severe cases, surgery may be needed. Cavaliers are very friendly dogs, including with strangers, but like all dogs they use barking to communicate. And like a lot of small dogs, if you let them then they may start to bark excessively. It’s important, therefore, that you train your dog when not to bark from an early age. Cavaliers are prone to suffering from separation anxiety and when they do, they can start to be destructive and bark non-stop. The best way to train them is to reward them when they stop barking and to ignore them when they do bark. The worst thing you can do to try and get a dog to stop barking is to shout at them. When you shout at them, they think there really is something wrong that they need to bark at and they’ll bark even more. Cavaliers are reasonably intelligent and are eager to learn which makes training them straightforward. Positive reinforcement training is the most effective and kindest way of training a dog. Things such as shock collars should be avoided as they cause your dog pain. You want your dog to love, trust and respect you not to be scared of you. Reward good behavior with treats, praise and petting. Your dog will soon learn which behaviors please you. And as dogs like to please their owners they’ll start to show those behaviors more and more. Because of their gentle and soft nature, shouting at Cavaliers is counter-productive. Indeed, shouting at any breed is not a good way to train them. Like all small, cuddly dogs, Cavaliers are susceptible to small dog syndrome. Make sure you don’t spoil your dog, and make sure you’re firm with them when needed so that they know who the pack leader is. The Cavalier King Charles Spaniel does shed a lot, more so than average. If you get a Cavalier, be prepared to find their hair on your clothes and furniture. Changing your Cavalier’s diet can help to reduce the amount of shedding somewhat. If you’re looking for a non-shedding small dog, then the Cavalier is not the best choice. Blenheim Cavaliers are a rich chestnut color with a pearly white background. Sometimes you’ll find a chestnut spot on the forehead. This is known as a lozenge or “blenheim spot”. 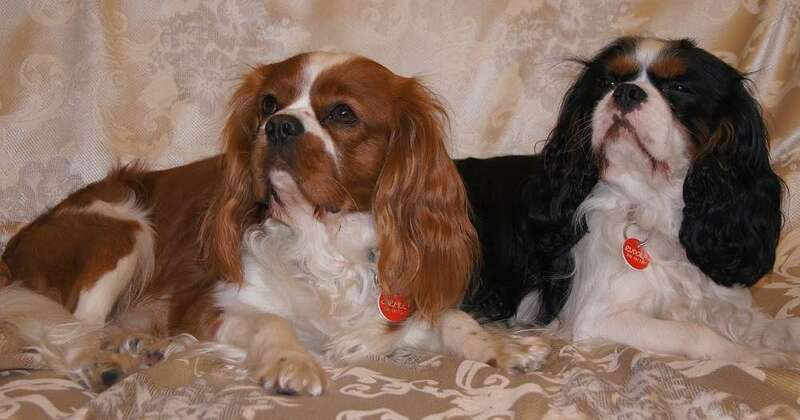 Black and tan Cavaliers have a black body with tan markings. In particular, the face, eyes, the inside of the ears, and the underside of the tail are usually tan, as well as the legs and the chest. The ruby Cavalier have no markings, they are completely chestnut in color. Sometimes you may find some white in their coat but according to AKC (the American Kennel Club) show rules this is a fault. The tricolor Cavalier has a white dog with mainly black markings. It has tan markings on the cheeks and inside the ears, as well as on the eyes and under the tail.